Anyone want to complete the job? Last Sunday, given I had the house to myself, and being in a silly mood, I decided to do something I hadnt done since Christmas, and hadnt done decently since Hollywood, do a few selfies. But yes, the emphasis was, on being silly. 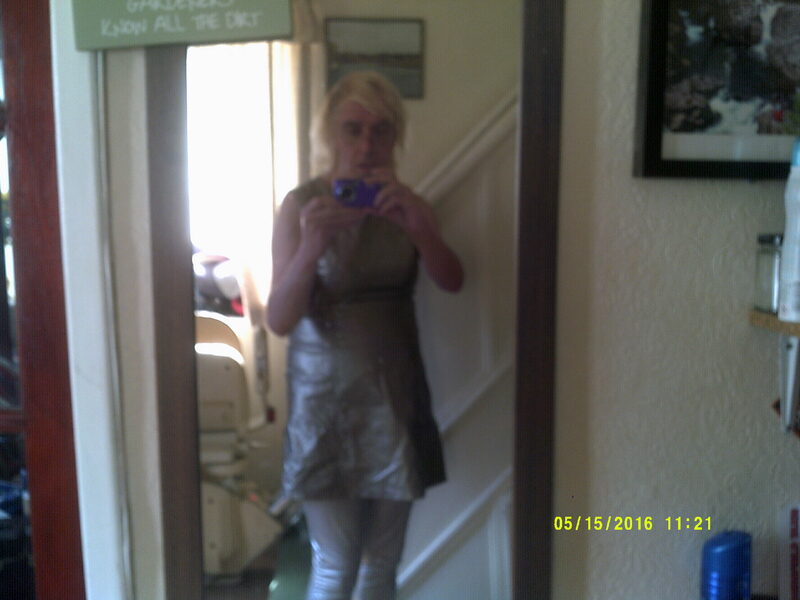 So, I put on a metallic silver dress I bought cheap in Primark several years ago, and had probably never worn in the end, because of length issue (its above the knees, for heavens sake! ), and to save people’s eyes, put on a pair of metallic silver leggings, to match. Eventually, and I mean, eventually, I managed to get a couple of decent ones, so I saved them. 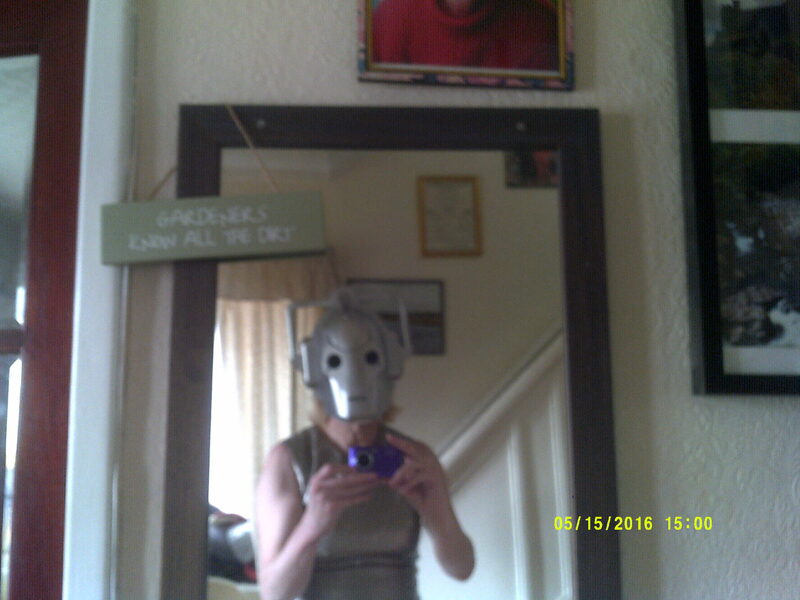 Then, being extra silly, I went and got my Cyberman helmet that I still own, and did a few more wearing that. Believe me, you have no idea how much “fun” it is, trying to take pictures of yourself while wearing that! Alright, that wasnt the end of the fun, as when I went to download them on to here, I couldnt find my USB connector to do so. So fine, I had a hunt around, still couldnt find it, so I paid out for a new one on Amazon. Yes, all of £4, so I’ll survive! So today, I finally got everything together, and loaded them on to here, and I thought I’d better share a couple. I gained a friend over on Facebook, someone in Australia, who I dont know, but was seemingly friend, of a friend, and all that. Given he posted some gorgeous pictures, both old, and created, I happily accepted him. Shrewd move, as next thing I know, he’s adding a gorgeous photo of a 30’s lady to my timeline, which I absolutely adored. Today, when I get up, I discover another photo, this one of me, designed as a sort of birthday card thing. Loved it, as did a few others. So this afternoon, not wanting to just post them on here, without his permission, I sent him a message, asking if it was OK to do so. Anyway, to cut a long story short, I think he thought I was objecting to him just using the photo of me, and got an apology back, and discovered he’d removed (or at least, made dormant) that Facebook account. Yes, fine, maybe I should have at least saved them to my collection in advance, but I never dreamt he’d do that! Yes, not a happy bunny! Only other news, I got cash for my birthday, so I’ve pretty much decided I will go over Elland on Saturday night, spend it on that, seems a good way to do so. And yes, play at spotting Jean Harlow on the big screen! Fine, the video. You could say this is how I feel about events re those pictures this afternoon!